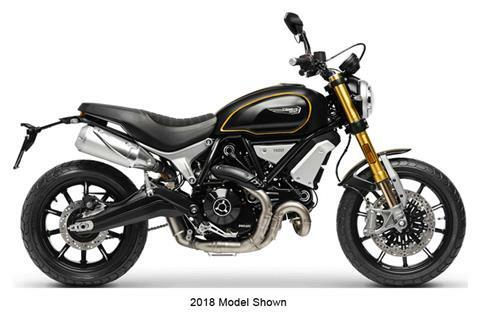 The sportiest Scrambler ever. Inspired by the “racer” customizations, it has an unmisteakable style. And it provides performances able to emotion even the most expert bikers, thanks to the equipped Adjustable Öhlins suspensions, the “Viper Black” colour with yellow central stripes and under side covers, aluminium wheels, low handlebar and bi-material seat cover. VIPER BLACK: A bold, yet elegant colour: black with yellow details. ÖHLINS FORKS: Adjustable forks, to express yourself on every kind of road. ÖHLINS SUSPENSIONS: Back suspension for a more comfortable ride, in every condition and every kind of biker. BI-MATERIAL SEAT COVER: Dark, to match the soul of the bike, with a bright constrat given by the yellow seam. ALUMINIUM DOUBLE SWINGARM: Style is in every detail, no matter how small. The unique mood of the bike is given by this piece that perfectly coordinates with the others. BLACK FUEL TANK SIDE COVERS: Black, but with yellow under side panels that go along with the bold personality of this model. Front - 10-spoke in light alloy, 3.50 x 18 in.